Staying in the Windsor area but looking to do some sightseeing in London? 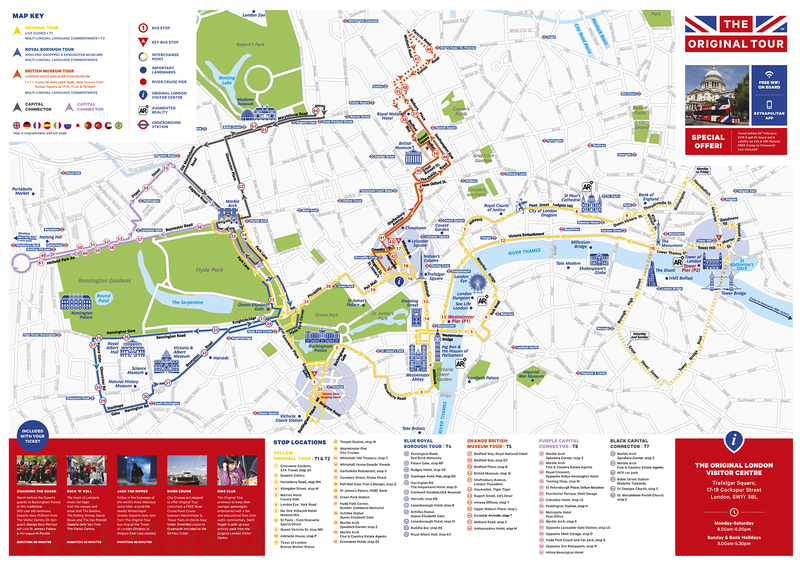 Why not experience the best of London on board the Original Tour’s famous red open-top buses. London's most popular sightseeing tour is the ultimate introduction to the capital. Entertaining live guides, eleven foreign-language commentaries, FREE walking tours, FREE River Cruise Pass, and exclusive Kids' Club are all included in the 24-hour ticket. Departs every 15-20 minutes, but times will differ seasonally and for each tour route. Will we get a commentary? YES - There is a full commentary in English and a choice of eleven other languages (German, French, Spanish, Italian, Russian, Japanese, Portuguese, Mandarin, Arabic & Brazilian Portuguese). Will the children enjoy it? YES - You can relax and enjoy the tour whilst your children (and everyone else's) are entertained and informed by our highly acclaimed "Kids Club" commentary and their free London activity packs. "Kids Club" is featured on our Yellow Route, Orange route and Blue Route service. Will we be able to hop-on and hop-off? YES - Your tour tickets are completely unrestricted. You can travel on any of our tour buses. Each route makes frequent stops - simply hop-off where you want to and return to the same stop to continue your tour. Can we tell which route each bus is on? YES - Each bus displays a coloured triangle on its front. Can we join the tour at any stop? YES - But we strongly recommend that first timers board at one of our main departure points where our staff can provide advice about traffic conditions on the day and final departure times. You may then choose to stay on the bus for a complete tour to get fully orientated or hop-on and hop-off at your leisure. Can we use our tickets all day long? YES - Tickets are valid until the same time the next day for use during our operating hours. Ask staff when you should board your last bus of the day as times vary seasonally throughout the year. Will we be able to recognise the bus stops? YES - The bus stops are the same as the TfL red buses, and on the stop it will state "The Original Tour" and the coloured triangle of the route, alongside the other buses that use that stop. Can you tell me how long the tour takes? YES - The Yellow tour routes take approximately 2.5-3 hours and the Blue tour route takes about 90 minutes, if you stay on-board for a full loop. Alternatively, you may hop on and off and re-join the tour at any Original Tour bus stop. Our buses run approximately every 15-20 minutes, and in the summer months the buses can be as frequent as every 5 minutes (on the Yellow Route).